We’re always proud and excited at Pixelwave Creative to provide filming and video production support to charities and fundraising events across the UK. And 2018 was no exception. Once again, the Pixelwave Creative team enjoyed a jam-packed agenda of working with truly inspiring people and charitable organisations. In early Spring, we got involved with an innovative art project celebrating local businesses and individuals that support the Mayor of Bury’s chosen charities – this year: Bleakholt Animal Sanctuary, Bury Hospice and the Royal National Lifeboat Institution. As well as being a local business to feature on the ‘The People’s Art’ charity art wall at Bury Town Hall, we also captured the launch event on film – you can find out more about the wall of art here. In April, it was a drive over the Pennines to Elland Road in Leeds for the glitzy Yorkshire Choice Awards. We were thrilled to be the event’s official videographer for the second year running, helping to raise money for its chosen charity Bethany’s Smile by filming the evening’s escapades. We returned to Leeds again in May – this time, Headingley Stadium – to support the Danny Jones Defibrillator Fund Ball for another year. It was such fun supporting this fundraising event – capturing all the action of the ball and producing a highlights film to support future marketing and fundraising. 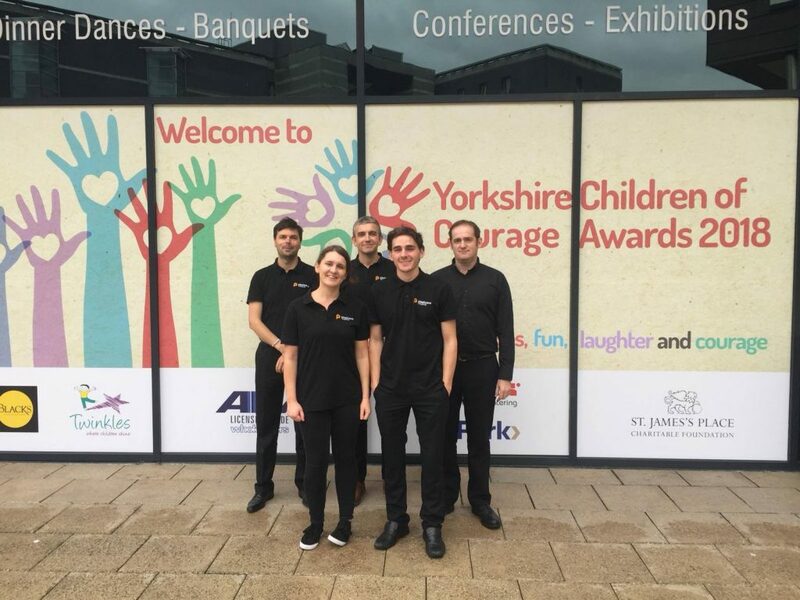 October’s Yorkshire Children of Courage Awards at New Dock Hall in Leeds celebrated the achievements and bravery of children, young people and their families and carers, while raising funds for the St. James’s Place Foundation. This video we produced introduces you to PACT, the Sheffield children’s charity voted as the People’s Choice in 2017. Back for its second year, we supported the JDRF – The Promise Ball at Queen’s Hotel in Leeds in November. Once again, we produced video content to help raise awareness and support fundraising for type 1 diabetes. Also this year, it was certainly a delight to support Chris Pointon and his #hellomynameis campaign. We had a fab day at the Royal Bolton Hospital capturing the response from staff on one of the many stops on Chris’ international tour. Of course, we also made sure there was time to move from behind the camera to don our own glad rags. It’s always brilliant to enjoy being a guest at some brilliant fundraising events, too. In 2018, we were honoured to attend the Bury Means Business Black Tie Ball, the Bleakholt Black Tie Ball, the Masquerade Ball for Bury Hospice and PSPA, and JDRF’s The Promise Ball. Roll on next year’s adventures…. If you’re hosting a charity event in 2019 and would like video production support, get in touch to find out how Pixelwave Creative can help. From nomination videos to event highlights, we have a special rates card for charitable organisations.